#AceMarketsNews – July.03: LONDON (Reuters) – Britain’s blue-chip share index marked its biggest weekly drop in a month on Friday, with miners slipping on a slowdown in China and banks falling after Brazil said it was investigating some global lenders’ currency market activity. The index fell broadly in line with shares across Europe before a Greek referendum on Sunday on its debt terms that may decide the country’s future in Europe. The FTSE 100 closed 0.7 percent lower at 6,585.78 points and hardly moved on data showing Britain’s services sector grew more than expected last month. The index has fallen more than 2 percent so far this week, marking its worst weekly percentage fall since early June on concerns about Greece’s debt crisis. The banking index fell 1.2 percent on news that Barclays, HSBC, Royal Bank of Scotland and Standard Chartered were among those under investigation on suspicion of rigging the Brazilian real. Royal Bank of Scotland fell 1.9 percent, also hit by news the bank may need to pay $13 billion to settle claims that it misled investors in mortgage-backed securities, according to documents filed in a U.S. court. The UK mining index fell 1.2 percent after a survey showing services sector activity in China, the world’s top metals consumer, slowed to its lowest in five months in June. Rio Tinto, BHP Billiton and Anglo American all dropped about 1 to 1.9 percent. A further sharp sell-off in Chinese stocks also weighed on sentiment. The rout has wiped trillions of dollars off Shanghai- and Shenzhen-listed shares. 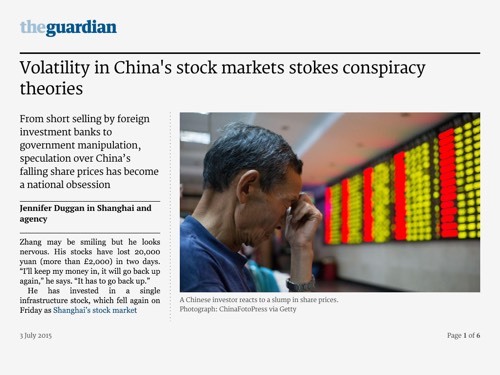 “The markets are looking at the bigger picture and focussing on what’s happening in Greece and China. The Chinese slowdown and stock market wobbles there are making their presence felt,” Commerzbank equity strategist Peter Dixon said. “Investors don’t want to be ‘long’ going into the weekend and would wait for the Greek referendum results for a clearer market direction,” he said. The International Monetary Fund delivered a stark warning on Thursday of the huge financial hole facing the country.